Whether it’s in the kitchen or in the bedroom, every space of the house could use a bit of organization. And the biggest part of the decision on the placement of these tidying helpers is that you want function and style. 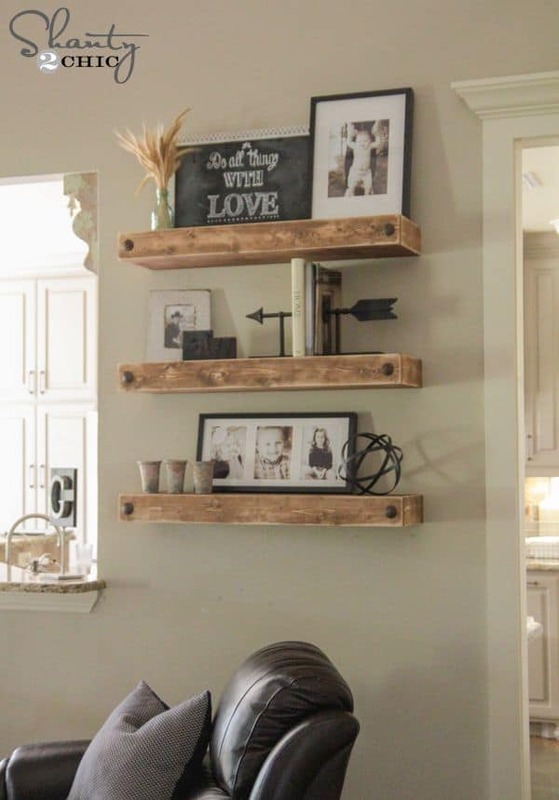 These 15 rustic shelving options are perfect for your farmhouse-flavored home! 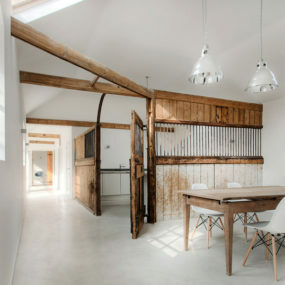 So, if you’re going with a country-infused feel, you may want to check out these ideas. There are so many funky ideas roaming the inter webs and we found this one while scrolling through Pinterest. 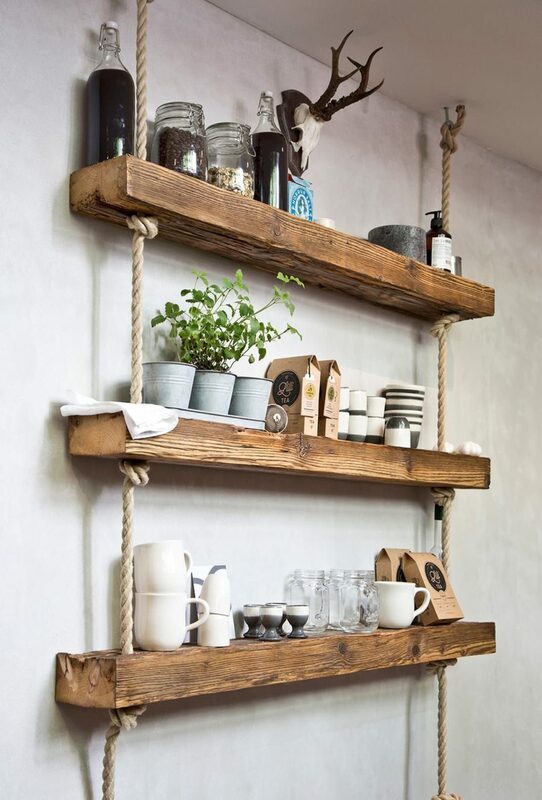 Whether you want to shop around for something similar or DIY some on your own, we are loving these hanging, metal and wood designs. They’re great for the bathroom, bedroom, or to hand in the hallways. 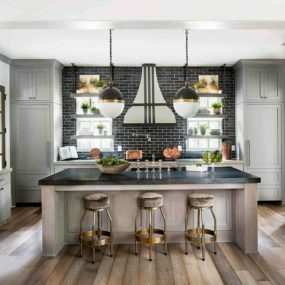 If you check out our friends at Homedit, you may stumble upon these beautiful pieces. 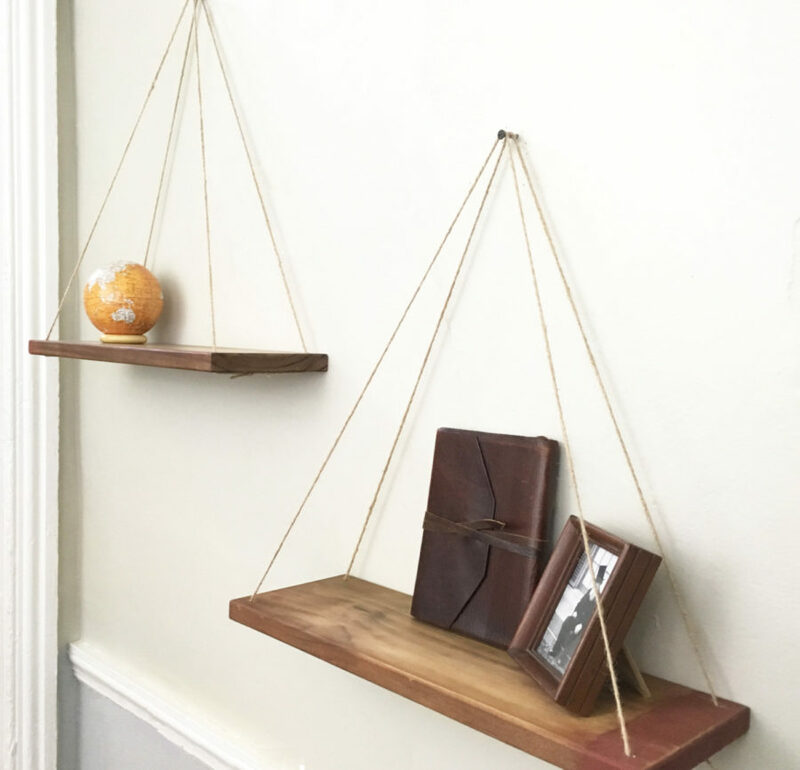 These raw-edged wood shelves are stunning to utilize in any room of the house. 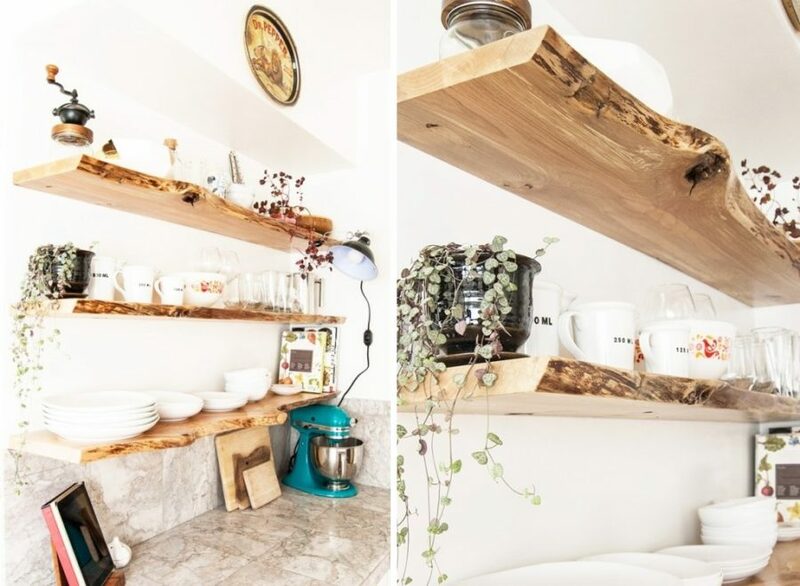 We particularly loved them in the kitchen to use as an “open shelving” remedy. 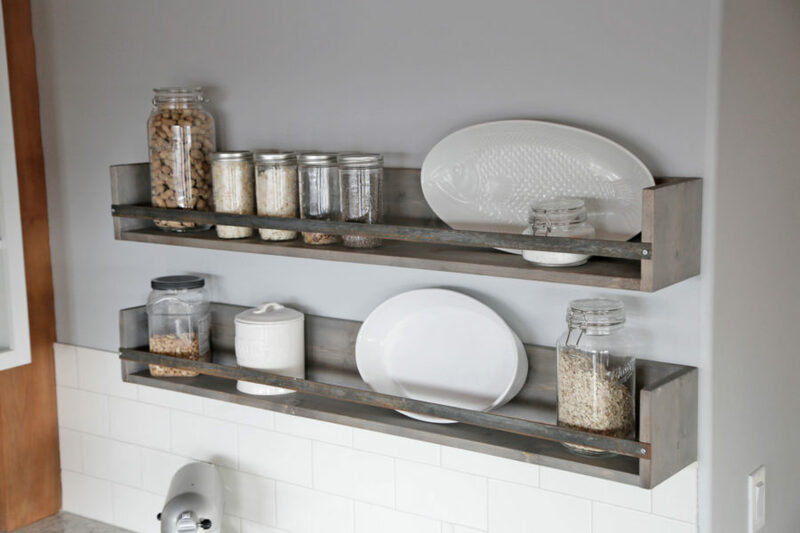 These gray pieces from Ana White remind us of craft organizers or spice racks in their own right. 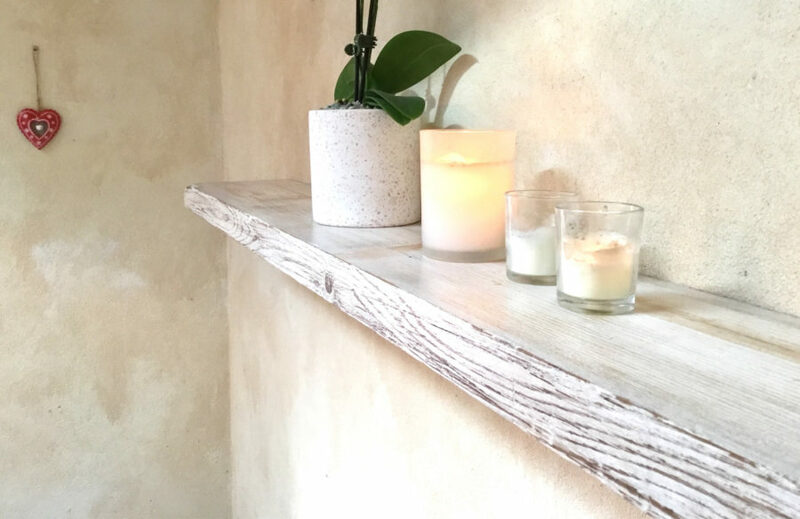 We love how easy these would be to DIY and the fact they they keep within the farmhouse feel but utilizes a different neutral shade. 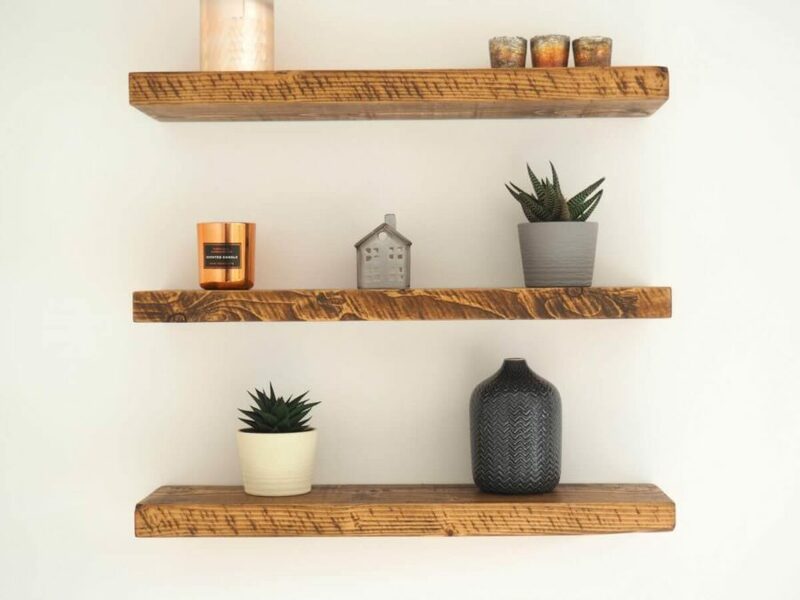 Over at Traditional Beams, you’ll find simple and chic wooden shelves that will fit into your rustic vision as well. And these ones specifically are one of our most versatile, because of their sharp and smooth edges, they’ll fit into more trendy or contemporary spaces as well. Follow along for more inspiration after the jump. 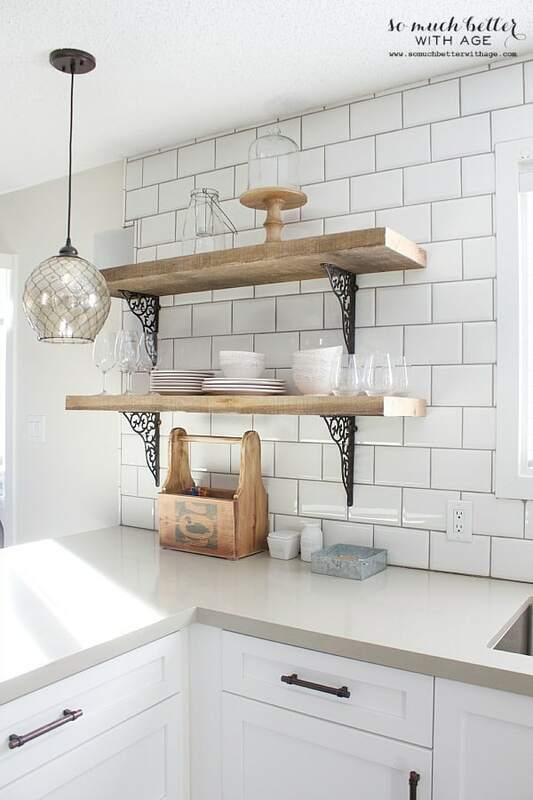 So Much Better With Age featured this kitchen peek that includes rustic, wood shelves that had a vintage accent. That metal piece at the bottom adds a fun bout of femininity and flair. If you’re looking for something a bit more personalized, this is the way to go. 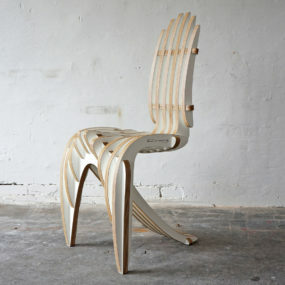 Design Trends offers up a lot of great inspiration as well. 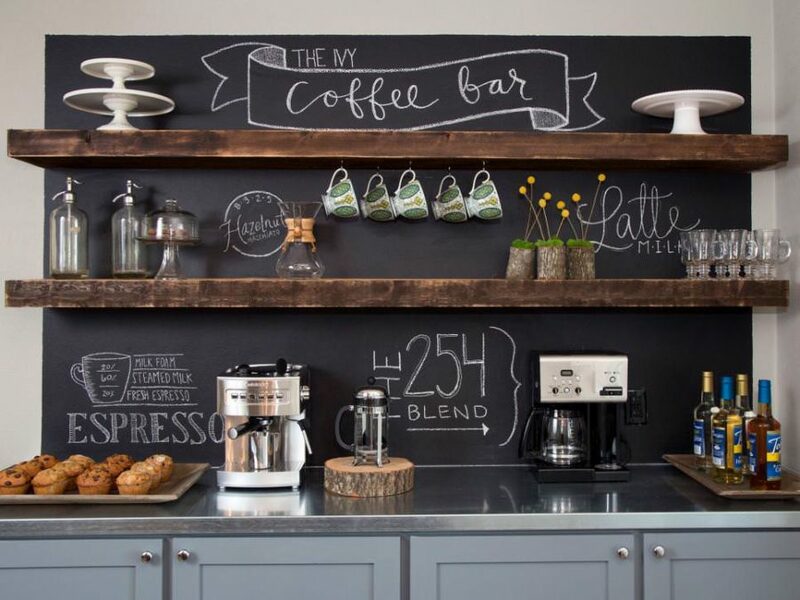 We fell in love immediately with this in-house coffee bar and a part of that are those natural wooden shelves. 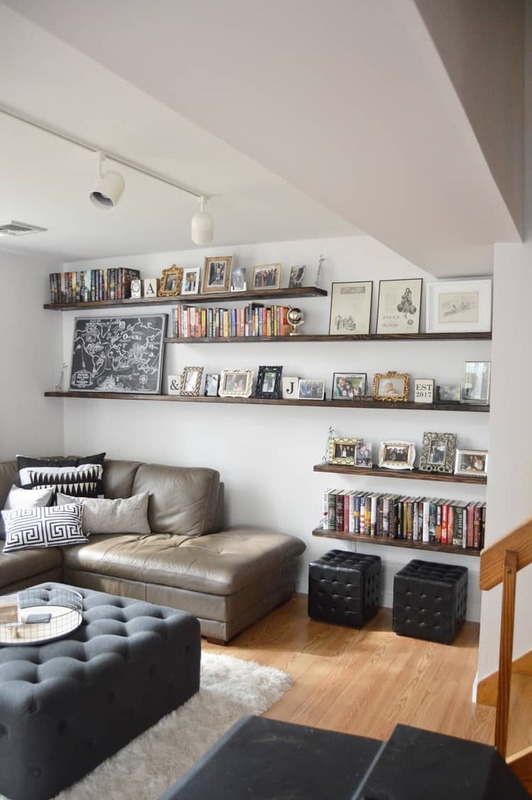 The open shelving makes for a lot more fashion-forward energy and works well with the chalkboard backing. 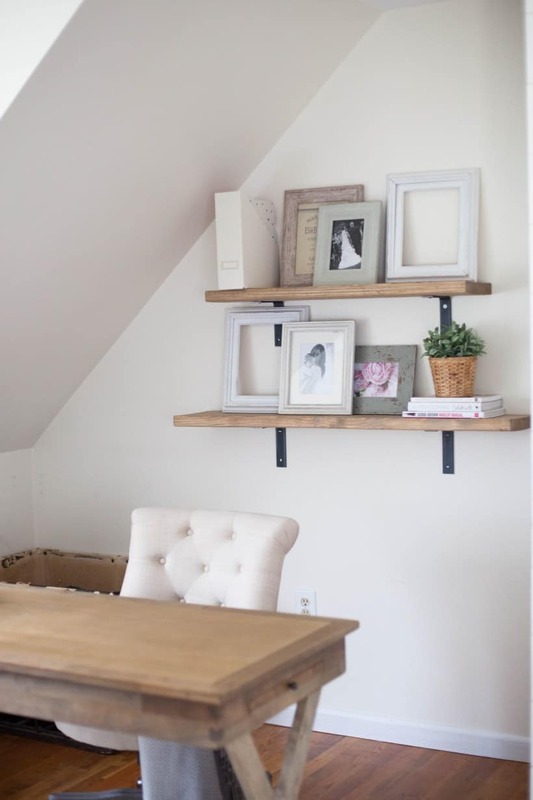 You can even add some rustic shelving in the home office as well. Just check out this little setup from Lauren McBride. 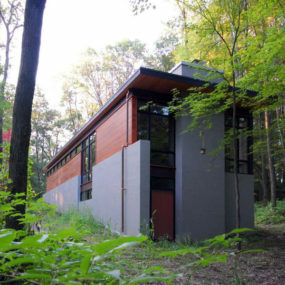 Wood and metal create the perfect balance. 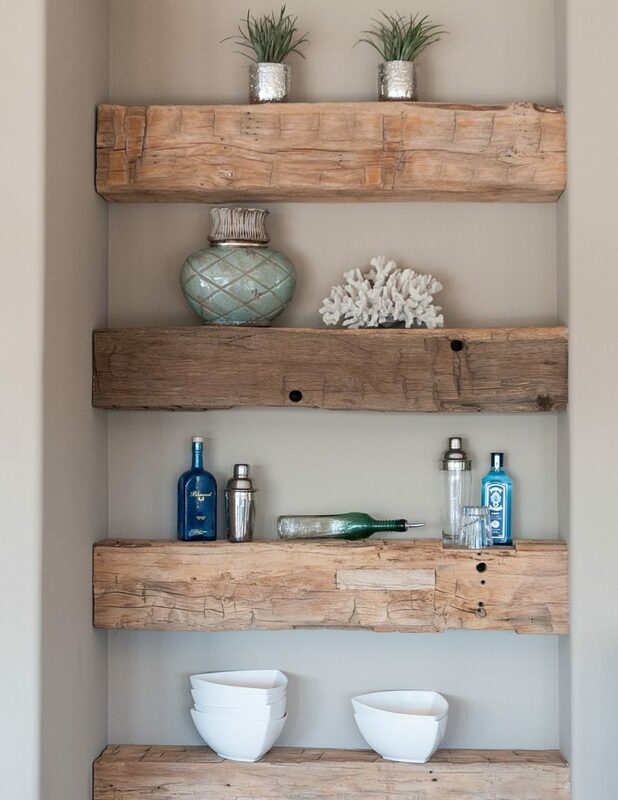 The Honeycomb Home has some simple, natural wood pieces hanging up as well. We like the easy button hardware placed on the edges and the fact that they easily float on the walls of the living room. Mix, match, organize or display, they’ll do it all. 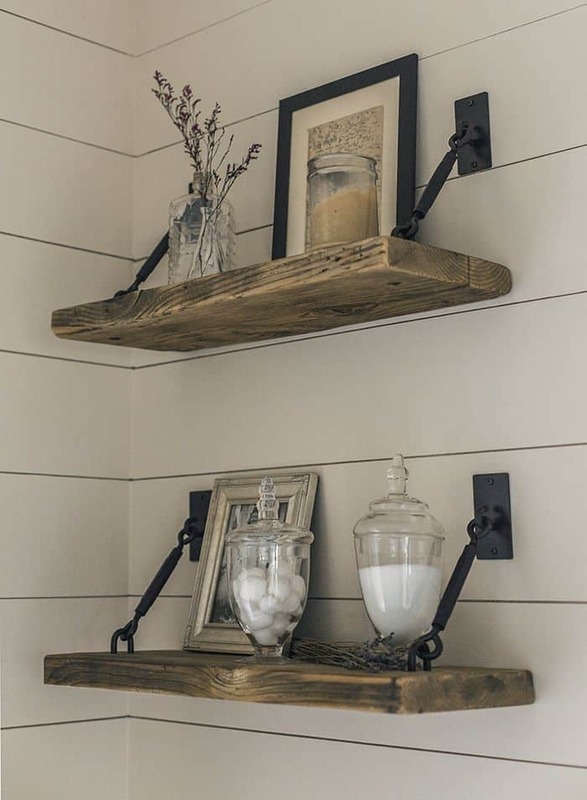 You can hang up your rustic shelving ideas as well. These styles can be bought or DIYed quite easily – even for our novice crafters. Check out more like this while visiting Storenvy. We really love this nook from Decoist because it utilizes a funky, offbeat portion of the home in the best of ways. 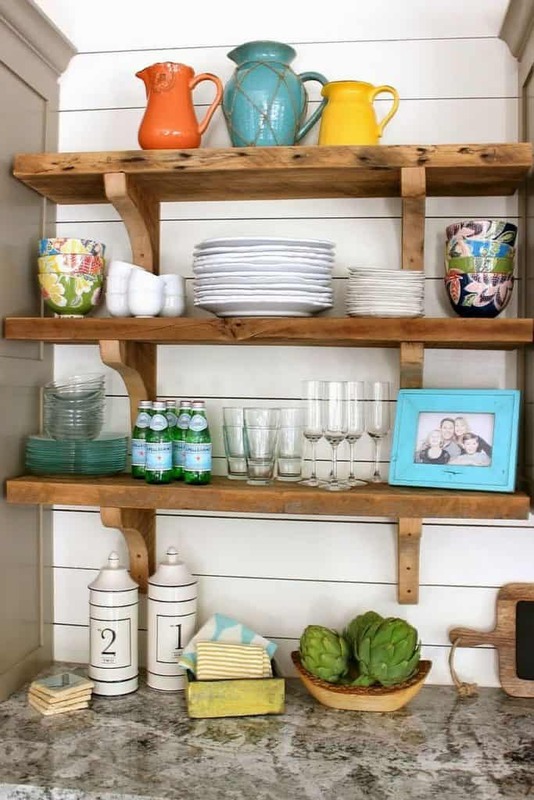 This small corner can be fixed with rustic, wooden shelves. 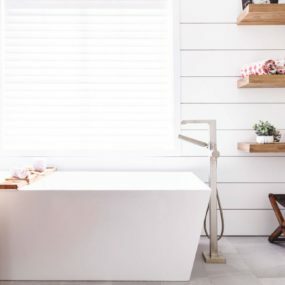 Bathrooms, hallways, officers, any space that has a similar crevice can be styled and organized to a T.
The Home Depot Blog has a good bit of inspiration for those looking for rustic style but slimmer, more modern editions. 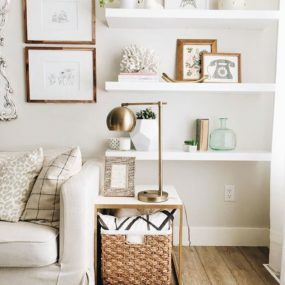 We love how this media room is filled with all the goods but done so in a way that’s neat, tidy, and using their self-made shelving unit. These rustic beauties from EVA Furniture has a quaint, cottage flair that we love. Perfect for kitchens or breakfast nooks, they’re what you would to display your dishes or mugs on. Check out more like this after visiting the link. 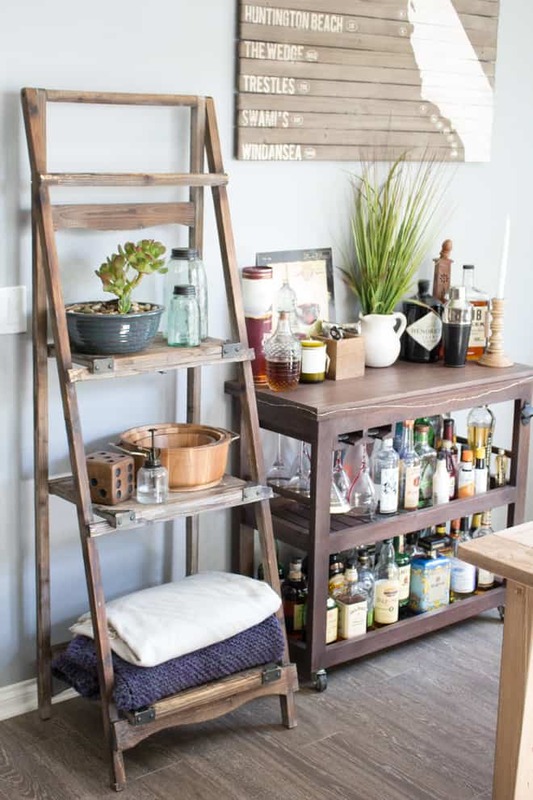 There are some standup rustic shelving ideas as well. Over at Dwelling Gawker, you’ll get a better look at ladder units that can help fill spaces and organize as well. Pile your blankets, books, and the like right onto each step up. Golden Whistler Wood Shop has a white distressed option to swoon for. We love this look for bathrooms or bedrooms as they have a more feminine, welcoming vibe to the finished style. And finally, this hanging masterpiece found on Pinterest blends so many pieces of our favorite things. There’s rusticism, there’s innovation, and there’s a funky, DIY appeal that you can tackle if you’re feeling adventurous.